Posted by Dave Emory ⋅ April 29, 2014Post a comment Email This Post Print This Post Tweet This! Swoboda leader Oleh Tiahanybok: This is what constitutes "moderation" to our media. COMMENT: We have covered the ascension of the OUN/B heirs in the Ukraine in a number of programs: FTR ‘s 77, 778, 779, 780, 781, 782, 783, 784. Noting that the provisional government there is directly evolved from the OUN/B Ukrainian Nazi administration and military apparatus of World War II, we have observed that the utter perversion of political and historical reality by our media is worthy of George Orwell’s 1984. In a post on the Ukrainian crisis, Robert Parry highlights the Orwellian nature of our media’s deliberate and fundamental misrepresentation of the situation there. In addition, Parry notes the inclusion of elements like Pravy Sektor and Swoboda (whom he jointly characterizes under the rubric neo-Nazis) into the national militas being sent to Eastern Ukraine as “anti-terrorist ” forces. As Parry correctly notes, “anti-terrorist” cadres have served as death squads in past U.S.-supported ooperations. We have noted in programs cited above (particularly 780 and 781) that Pravy Sektor and Swoboda specialize in street fighting and provocation. This is a very dangerous brew. Swoboda (whose leader is pictured above, right) and Pravy Sektor dominate the ministries in Kiev. “Ukraine, Through the US Looking Glass” by Robert Parry; Consortium News; 4/15/2014. FULL TEXT: The acting president of the coup regime in Kiev announces that he is ordering an “anti-terrorist” operation against pro-Russian protesters in eastern Ukraine, while his national security chief says he has dispatched right-wing ultranationalist fighters who spearheaded the Feb. 22 coup that ousted elected President Viktor Yanukovych. Ukrainian Secretary for National Security Andriy Parubiy. 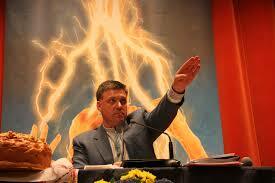 Parubiy himself is a well-known neo-Nazi, who founded the Social-National Party of Ukraine in 1991. The party blended radical Ukrainian nationalism with neo-Nazi symbols. Parubiy also formed a paramilitary spinoff, the Patriots of Ukraine, and defended the awarding of the title, “Hero of Ukraine,” to World War II Nazi collaborator Stepan Bandera, whose own paramilitary forces exterminated thousands of Jews and Poles in pursuit of a racially pure Ukraine. During the months of protests aimed at overthrowing Yanukovych, Parubiy became the commandant of “Euromaidan,” the name for the Kiev uprising, and – after the Feb. 22 coup – Parubiy was one of four far-right Ukrainian nationalists given control of a ministry, i.e. national security. Yet there Parubiy was on Tuesday bragging that some of his neo-Nazi storm troopers – renamed “National Guard” – were now being sicced on rebellious eastern Ukraine as part of the Kiev government’s “anti-terrorist” operation. Yet, with much of the Ukrainian military of dubious loyalty to the coup regime, the dispatch of the neo-Nazi militias from western Ukraine’s Right Sektor and Svoboda parties represents a significant development. Not only do the Ukrainian neo-Nazis consider the ethnic Russians an alien presence, but these right-wing militias are organized to wage street fighting as they did in the February uprising. Historically, right-wing paramilitaries have played crucial roles in “counter-terror” campaigns around the world. In Central America in the 1980s, for instance, right-wing “death squads” did much of the dirty work for U.S.-backed military regimes as they crushed social protests and guerrilla movements. The merging of the concept of “anti-terrorism” with right-wing paramilitaries represents a potentially frightening development for the people of eastern Ukraine. And much of this information – about Turchynov’s comments and Parubiy’s tweet – can be found in a New York Times’ dispatch from Ukraine. However, on the Times’ front page on Wednesday was a bizarre story by David M. Herszenhorn accusing the Russian government of engaging in a propaganda war by making many of the same points that you could find – albeit without the useful context about Parubiy’s neo-Nazi background – in the same newspaper. This argumentative “news” story spilled from the front page to the top half of an inside page, but Herszenhorn never managed to mention that there was nothing false in what Medvedev said. Indeed, it was the much-maligned Russian press that first reported the secret visit of CIA Director John Brennan to Kiev. Though the White House has since confirmed that report, Herszenhorn cites Medvedev’s reference to it in the context of “misinformation” and “conspiracy theories.” Nowhere in the long article does the Times inform its readers that, yes, the CIA director did make a secret visit to Ukraine last weekend. Presumably, that reality has now disappeared into the great memory hole along with the on-ground reporting from Feb. 22 about the key role of the neo-Nazi militias. The neo-Nazis themselves have pretty much disappeared from Official Washington’s narrative, which now usually recounts the coup as simply a case of months of protests followed by Yanukovych’s decision to flee. Only occasionally, often buried deep in news articles with the context removed, can you find admissions of how the neo-Nazis spearheaded the coup. For instance, on April 6, the New York Times published a human-interest profile of a Ukrainian named Yuri Marchuk who was wounded in clashes around Kiev’s Maidan square in February. You have to read far into the story to learn that Marchuk was a Svoboda leader from Lviv, which – if you did your own research – you would discover is a neo-Nazi stronghold where Ukrainian nationalists hold torch-light parades in honor of Nazi collaborator Stepan Bandera. Without providing that context, the Times does mention that Lviv militants plundered a government weapons depot and dispatched 600 militants a day to do battle in Kiev. Marchuk also described how these well-organized militants, consisting of paramilitary brigades of 100 fighters each, launched the fateful attack against the police on Feb. 20, the battle where Marchuk was wounded and where the death toll suddenly spiked into scores of protesters and about a dozen police. “Ukraine’s February revolution, said Mr. Koval, would never have happened without Right Sector and other militant groups,” the Times wrote. Yet, that reality – though actually reported in the New York Times – has now become “Russian propaganda,” according to the New York Times. This upside-down American narrative also ignores the well-documented interference of prominent U.S. officials in stirring up the protesters in Kiev, which is located in the western part of Ukraine and is thus more anti-Russian than eastern Ukraine where many ethnic Russians live and where Yanukovych had his political base. Bravo for Robert Parry and Spitfirelist for daring to publish the facts. We definitely live in a time of deceit where truth telling breaks the wall of secret lies, the abject rejection of professional journalism. When the Germans were driven out of the Ukraine, many OUN members who had served the Nazis’ police formations and execution squads fled with them, but several thousand retreated into the Carpathian Mountains to fight another day against the hated Soviet government. It was this remaining Nightingale group that fascinated the CIA and was recruited essentially en bloc. To bring its leaders to the United States for training and indoctrination required special bureaucratic exertions, as well as an immigration law permitting the admission of one hundred such immigrants per year, provided the Director of the CIA, the Attorney General, and the Commissioner of the Immigration and Naturalization Service all personally stated that the action was vital to national security.” As one army intelligence officer noted sardonically, one wing of the CIA was hunting Ukrainian Nazis to bring them to trial at Nuremberg, while another wing was recruiting them. After training in the United States, the Nightingale leaders were parachuted into the Ukraine to link up with their compatriots and to carry out measures of subversion, agitation, and sabotage, including assassination. [United States Secretary of the Navy and Secretary of Defense James Forrestal] vigorously supported the program and presumably participated in the approval of the basic NSC charters as a member of the National Security Council. The leader of the Nightingale group was Stepan Bandera. The leader of the “protests” in February 2014 which ousted the president of Ukraine is a neo Nazi and follower of Stepan Bandera. In other words, 70 years ago, the U.S. supported the types of fascists who are now in control of Ukraine. Postscript: Another little known historical fact is that – in 1997 – a former U.S. national security advisor and high-level Obama policy advisor called for the U.S. to take Ukraine away from Russia. And almost a month before the Ukrainian president was ousted in February, a high-level State Department official – Assistant US Secretary of State for Europe and Eurasia Victoria Nuland, wife of arch Neocon Robert Kagan – announced plans to promote a “new government” in Ukraine. Exclusive: The horrendous fire in Odessa, killing dozens of ethnic Russians protesting against the U.S.-backed coup regime in Kiev, has lurched the country closer to full-scale civil war and disrupted the American media’s efforts to deny the existence of pro-regime neo-Nazis, Robert Parry reports. As much as the coup regime in Ukraine and its supporters want to project an image of Western moderation, there is a “Dr. Strangelove” element that can’t stop the Nazism from popping up from time to time, like when the Peter Sellers character in the classic movie can’t keep his right arm from making a “Heil Hitler” salute. This brutal Nazism surfaced again on Friday when right-wing toughs in Odessa attacked an encampment of ethnic Russian protesters driving them into a trade union building which was then set on fire with Molotov cocktails. As the building was engulfed in flames, some people who tried to flee were chased and beaten, while those trapped inside heard the Ukrainian nationalists liken them to black-and-red-striped potato beetles called Colorados, because those colors are used in pro-Russian ribbons. Note that the gang responsible for shoving protestors into the building and then lighting it on fire reportedly included members of Pravy Sektor. The death by fire of dozens of people in Odessa recalled a World War II incident in 1944 when elements of a Galician SS police regiment took part in the massacre of the Polish village of Huta Pieniacka, which had been a refuge for Jews and was protected by Russian and Polish partisans. Attacked by a mixed force of Ukrainian police and German soldiers on Feb. 28, hundreds of townspeople were massacred, including many locked in barns that were set ablaze. The legacy of World War II – especially the bitter fight between Ukrainian nationalists from the west and ethnic Russians from the east seven decades ago – is never far from the surface in Ukrainian politics. One of the heroes celebrated during the Maidan protests in Kiev was Nazi collaborator Stepan Bandera, whose name was honored in many banners including one on a podium where Sen. John McCain voiced support for the uprising to oust elected President Viktor Yanukovych, whose political base was in eastern Ukraine. Though most of the Maidan protesters in 2013-14 appeared motivated by anger over political corruption and by a desire to join the European Union, neo-Nazis made up a significant number. These storm troopers from the Right Sektor and Svoboda party decked out some of the occupied government buildings with Nazi insignias and even a Confederate battle flag, the universal symbol of white supremacy. Then, as the protests turned violent from Feb. 20-22, the neo-Nazis surged to the forefront. Their well-trained militias, organized in 100-man brigades called “the hundreds,” led the final assaults against police and forced Yanukovych and many of his officials to flee for their lives. In the days after the coup, as the neo-Nazi militias effectively controlled the government, European and U.S. diplomats scrambled to help the shaken parliament put together the semblance of a respectable regime, although four ministries, including national security, were awarded to the right-wing extremists in recognition of their crucial role in ousting Yanukovych. But the problem with some western Ukrainians expressing their inconvenient love for Nazis has not been limited to the current crisis. It bedeviled Ronald Reagan’s administration when it began heating up the Cold War in the 1980s. As part of that strategy, Reagan’s United States Information Agency, under his close friend Charles Wick, hired a cast of right-wing Ukrainian exiles who began showing up on U.S.-funded Radio Liberty praising the Galician SS. These commentaries included positive depictions of Ukrainian nationalists who had sided with the Nazis in World War II as the SS waged its “final solution” against European Jews. The propaganda broadcasts provoked outrage from Jewish organizations, such as B’nai B’rith, and individuals including conservative academic Richard Pipes. What the Reagan administration apparently didn’t understand three decades ago – and what the U.S. State Department still has not seemed to learn today – is that there is a danger in stirring up the old animosities that divide Ukraine, east and west. Though clearly a minority, Ukraine’s neo-Nazis remain a potent force that is well-organized, well-motivated and prone to extreme violence, whether throwing firebombs at police in the Maidan or at ethnic Russians trapped in a building in Odessa. As vengeance now seeks vengeance across Ukraine, this Nazi imperative will be difficult to hold down, much as Dr. Strangelove struggled to stop his arm from making a “Heil Hitler” salute. Part of what makes overtly monstrous actions like this so terrifying is that it’s happening within the context of the looming May 25 elections and it’s not exactly clear if mass murdering citizens is the type of move that will lead to a mass rejection of the neo-Nazi parties or the type of escalation of the situation that derails the elections altogether. It also raises the question of why the west and Kiev hasn’t simply offer to dump any Pravy Sekvor and Svoboda politicians from the interim government. After all, they could still win seats in the May 25 election, so why not show the ethnic Russians that Kiev has no interest in any government with installed neo-Nazis? Wouldn’t that neutralize the demands coming out of Moscow and potentially calm the situation? Or are there concerns that if the neo-Nazis got kicked out they would start acting like, well, neo-Nazis, and going around burning down buildings and trying to provoke a civil war?